Girard-Perregaux is one of the true greats of the Swiss watch industry and one which long held one of the most glamorous images in high-end watchmaking. The company developed and produced in-house, some of the most technically advanced watches ever made – notably Tourbillons, Minute Repeaters and other refined Grande Complication models. It was one of the many great Swiss watch companies to struggle through the ‘Quartz Crisis’, but it is now back in its stride once again and commanding the respect it rightfully deserves. In the novel “From Russia With Love”, and no less than on the first page, author Ian Fleming wrote, “a gold Girard-Perregaux on a Brown Crocodile strap is one of the typical membership badges of the rich man’s club”. More recently, the company has worked very closely with Ferrari, releasing chronographs under both brand names. The company recently celebrated its 225th anniversary, making it one of the oldest remaining watch companies continuously engaged in production. Girard-Perregaux is credited with many firsts and claims to fame, having registered over 100 patents and won numerous exhibition medals and observatory prizes. Notably, a gold medal presented to Constant Girard for a Tourbillon at the Universal Exhibition in Paris in 1867, then again in 1889, the famous Tourbillon with Three Gold Bridges, Constant Girard’s masterpiece and the fruit of many years labour, received the gold medal at another Universal Exhibition in Paris. As early as 1840, one of the founders, Constant Girard, began to develop the innovative concept of wearing watches on the wrist and later in 1879, his wristwatches were ordered personally by Emperor Wilhelm I for officers in the German Imperial Navy. Two thousand were made, making this the first large-scale commercial production of wristwatches in history. In recognition of its ongoing quest for precision, in 1905 Girard-Perregaux was elected a permanent member of the jury at the largest international watch fairs. The golden age for Girard-Perregaux really began in the 1920s, continuing through to the 1970s, seeing the company grow rapidly in both its expertise and strength across Europe, Asia, and the Americas. In the 1940s, the company produced a popular range of sports and military watches using the strapline “For Active Service”. These waterproof, shockproof, antimagnetic, and luminous watches carried names such as the Mermaid, Sea Hawk, Amphibian and the ‘M.D. Waterproof’. The Sea Hawk remained popular up to the end of the 1960s when it was withdrawn. However, this model has recently been revived as a highly competent, professional divers watch. In 1956 Girard-Perregaux introduced its first automatic watch, the Calibre 21, 39 Jewels ‘Gyromatic’ which used a highly advanced Gyrotrone automatic reverse gear winding system, which caused a sensation across the watch industry. 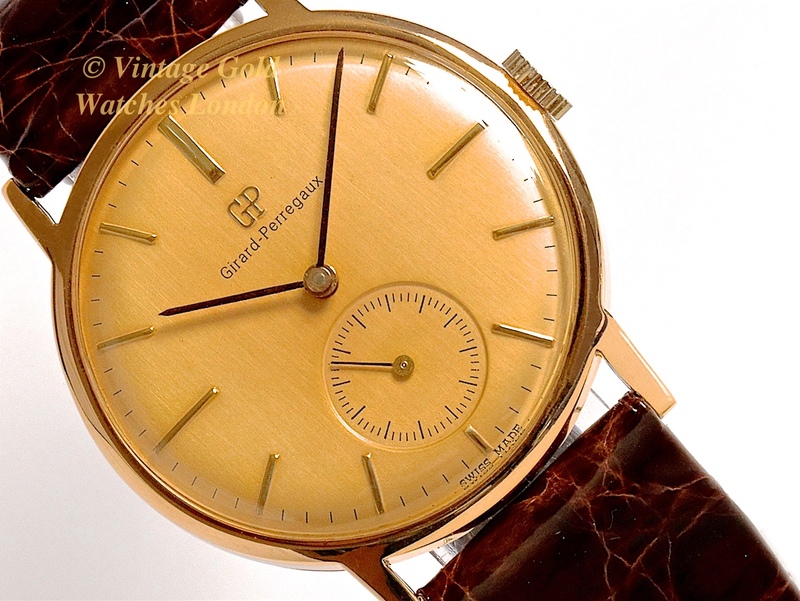 The Gyromatic was continually developed until in 1966, the Girard-Perregaux Gyromatic Chronometer HF was launched. This was the first ever high-frequency movement with a balance vibrating at 36,000 times an hour, or 10 beats per second. In 1966 this unrivalled movement was awarded the Centenary Prize by the Neuchatel Observatory and brought what is now recognised as true precision to watchmaking for the first time. A year later in 1967, 70% of all the Chronometer certificates issued by the Swiss Neuchatel Observatory went to Girard-Perregaux’ Chronometer HF models. These were some of the most accurate mechanical wristwatches of all time. A simply stunning 18ct Girard-Perregaux gentleman’s dress watch in a 36mm oversize case, which is very large for this period. The colour of the dial is unusual today, but very much of its period, while its classic style with its large subsidiary dial is timeless. Girard-Perregaux is famous within the Swiss watch industry for the technical innovations and craftsmanship demonstrated in all of their movements. If one takes a little time to study photographs of the various watch movements on this website and elsewhere for examples of either Zenith, Longines and particularly IWC, one begins to notice certain similarities among the best quality movements such as this. Simple things like a large balance wheel in proportion to the rest of the movement, for accuracy. Also the tiny adjustable screws around the balance used for ‘poising’, i.e. balancing the balance and correcting temperature error, then the layout of the bridge and the other top plates, also the quality of the chamfering of these plates, but perhaps most of all, the proportions and cohesiveness of the design. Like many mechanical things designed and built to perform a function, purity and form are often linked with performance. Needless to say, we greatly admire this movement! As can be seen, the movement is properly signed, Girard-Perregaux, Swiss, Adjusted, 17 Jewels, Fab Suisse with the Calibre number 03 and the reference number E804. Our vintage specialist watchmaker has given this movement a full inspection, overhaul and service and commented he found it to be clean and well maintained. Upon completion, he has carefully calibrated the watch and after our final checks and prior to photography, the watch was found to be keeping time to within +6 seconds per day! This was tested and confirmed by our electronic Timegrapher and is truly outstanding for any watch of this age. As can be seen, the movement is in very clean condition. We are therefore very happy to offer the watch with 12 months warranty*. With care and with regular servicing around every 3 years, we would fully expect this watch to run quite happily for many more decades to come. The light golden dial carries applied gilt baton hour indices, matched by original black ‘Index’ hands. It catches the light beautifully and subtly changes in colour, depending on the ambient light. It is understated and perfectly balanced and this classic style, with a subsidiary seconds dial, is exactly the style which many watch companies are reviving in the form of numerous heritage and re-releases available today. The lens has been replaced with a new original replacement. This is the original dial, restored to the highest standards by our dial restorers which are considered to be the best in the UK. The 18ct yellow gold case measures 36mm in diameter, excluding the correct matching unsigned crown. This is exceptionally large for the 1940s and so is referred to as oversize. The case is also quite slim for this period and very elegant in design with a very thin bezel and straight lugs. It is in excellent condition, having received a very gentle and sympathetic clean and polish, although the watch has obviously been very well cared for as there are no dings, scratches or marks visible to the naked eye. The inside of the case-back carries Geneva Swiss hallmarks and externally, the case serial number 194576 is very clear and distinct, indicating the watch case has not been overpolished. The case-back is also, importantly, of full thickness and has never been engraved. A high quality Brown Crocodile strap has been fitted, along with the original Girard-Perregaux solid gold vintage buckle. We feel the strap matches the watch nicely, however if a different colour or style of strap is preferred, please let us know and we will do our best to oblige free of charge. We carry tan, conker, dark brown and black in stock in plain padded leather, crocodile skin or lizard skin, and we can obtain most other types and colours at short notice. Although there are no original papers with this watch, all the numbers and markings on the watch are correct, dating the watch to circa 1948. Detailed particulars will be included with our purchase receipt and 12 months’ warranty*. A separate insurance valuation for the replacement value of this watch will be provided at the time of sale along with our unique ‘Lifetime Authenticity Guarantee’ which states: “If this watch proves to be anything less than totally authentic, or not as described, Vintage Gold Watches of London will offer you a full refund at any time”. The hardwood presentation box shown in the photographs is included. This is a wonderful vintage gold watch from one of horology’s most highly regarded names which will provide an excellent financial investment as well as be something to use, wear, treasure and enjoy! This will make an excellent evening wear dress watch as well as a practical, accurate and reliable timepiece to use on a day to day basis if you wish. The higher profile of Girard-Perregaux during the past 10 years has helped vintage Girard-Perregaux watches become more and more collectable and we feel this is overdue. The sheer quality and rarity of great examples such as this, mean values are climbing. This watch will, therefore, make an excellent investment and family heirloom piece. As each year passes and the world market for vintage watches expands, availability will become more limited so prices are surely destined to climb ever higher! A word about our prices – We always try our hardest to acquire the very highest quality watches we can find before restoring these to the highest possible standards. We then offer these at the fairest prices we can, taking into account our pre and post sales care and service. This approach inevitably means we will never be the cheapest, but nor will we be the most expensive. Indeed there are a number of well-known stores in West London which are very successful, charging between two to three times the price you see here. We therefore consider our prices to be fair, given the quality of watches we have to offer. We will be happy to Service Repair or Restore your watch, all at ‘sensible’ prices. Please see here. If you have any questions, please call our landline 020 7727 7095 or mobile 07515 949 250. Or if calling from overseas our landline number is +44 207 727 7095 or mobile +44 7515 949 250.